71% of consumers do some digital research before buying an insurance policy, and 26% of those surveyed had purchased their policies online. Insurance companies are investing in interactive websites, mobile apps, and analytics software to help them optimize their processes, increase sales, improve customer service, and boost their financial standing. But is this enough to keep up? 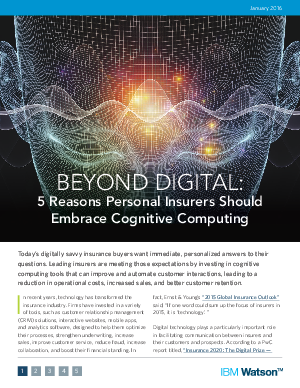 As technology continues to advance, leading insurance companies are already looking ahead to the next big advance that will transform the industry: cognitive computing.